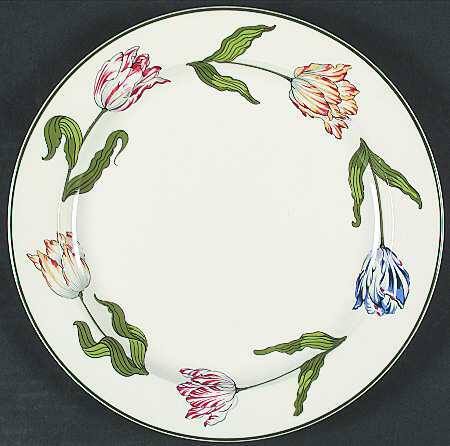 The Peak of Chic®: The Flowers of Tiffany & Co.
Years ago, Tiffany & Co. used to have the loveliest floral print china. Tulip lovers and wildflower fans alike could find a pattern that struck their fancies. That must be a thing of the past because a recent search on their website yielded only one such pattern. I admit that if I were allowed to have only one china pattern, it would not be floral. I would have to choose a Chinoiserie pattern. However, I do find floral patterns to be very charming. 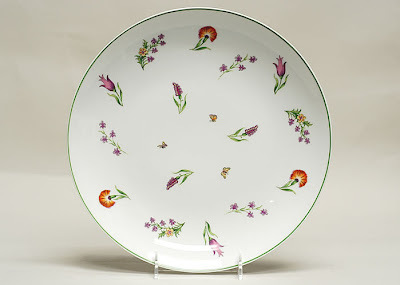 Can't you see using floral print dinner plates for a Spring or Summer dinner party or ladies lunch? What about serving dessert on a set of flowery dessert plates? A berry dessert would look lovely against the backdrop of delicate flowers. I realize that to some, floral china looks old-fashioned. And in a way, it does, but that's the charm of it. 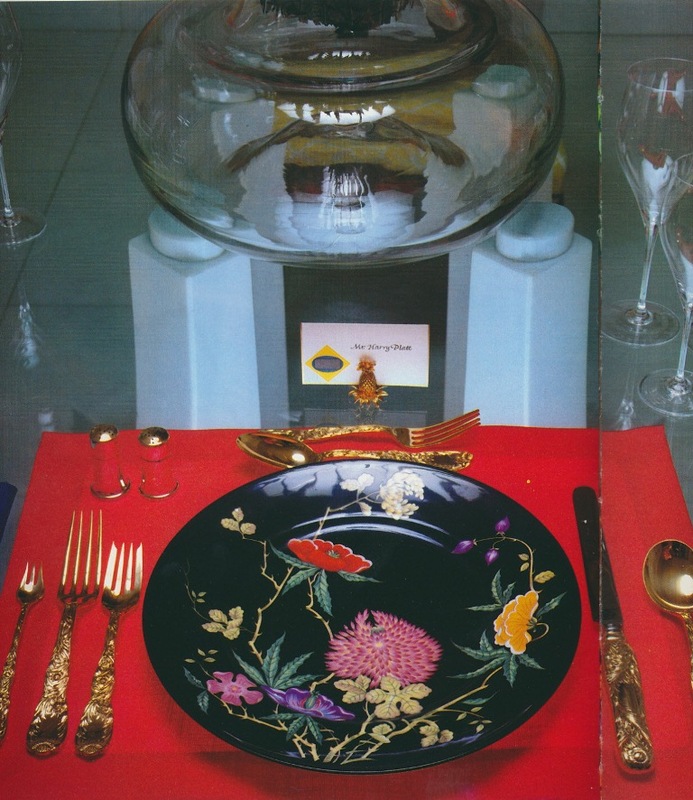 I searched the internet high and low for photos of discontinued Tiffany & Co. floral china, and if you ask me, I don't think any of the patterns look old nor stodgy. 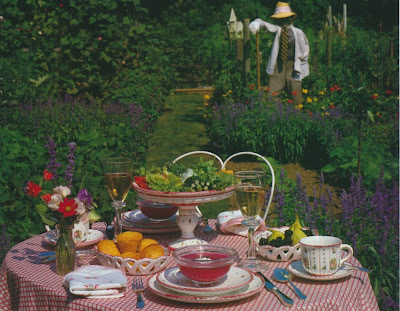 I've always loved Sybil Connolly's Mrs. Delany's Flowers for Tiffany & Co. The black background is a nice twist. Image at top: Tiffany's Biedermeier earthenware; photo from Tiffany Taste ; the other two tabletop photos from New Tiffany Table Settings . I just LOVE the lilies of the valley at the top. 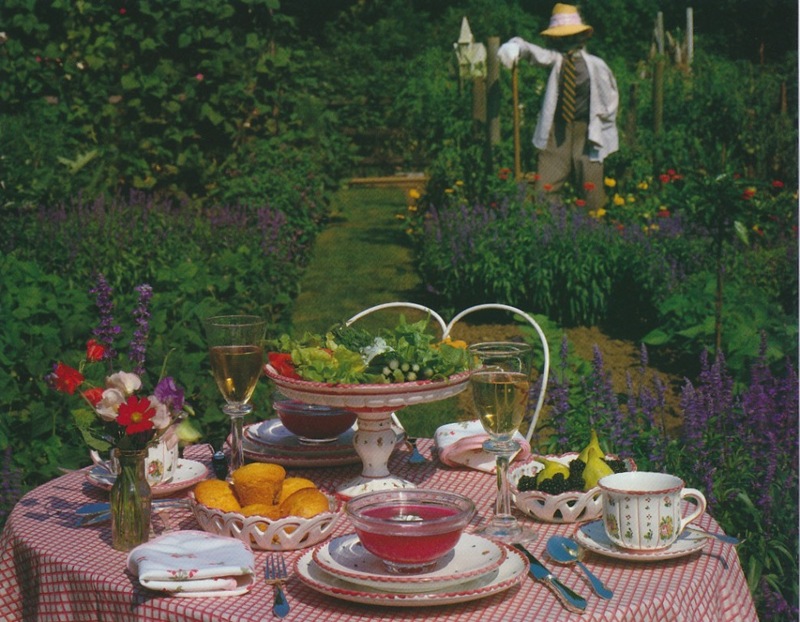 If this is a complete place setting, I bet the cup and saucer are beautiful! I have to confess that I find eating off of "busy" (for lack of a better word) plates off-putting. The confusion between the food and the design - I feel they detract from one another (if that makes sense). I am fine with patterned borders, but I just prefer the center area to be plain. That being said, "Tiffany Garden" is lovely and has always been a favorite of mine. I have a floral set - "Florence" by Pope Goesser that I love, but I use it only for dessert or tea/coffee service. Pamela, Actually, I don't find what you say weird at all. I think your solution of using a floral service for dessert only makes sense. I admit that dessert and salads look better on floral china than does something like meatloaf! Lovely options you've shown here (and the same goes for the covered butter dishes! 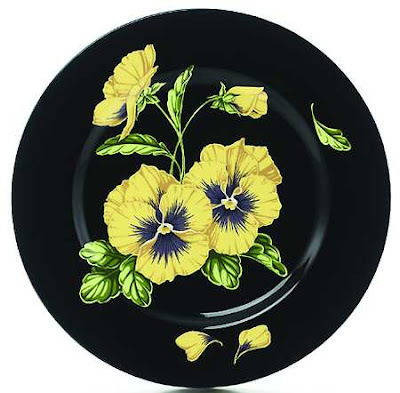 )I have been trying to find a set of dessert plates with a delicate pattern of violets. Ina Garten has a set I've admired on a few of her Barefoot Contessa episodes, which inspired me to find my own. Ina can do no wrong in my book. Boxwood- I agree that Ina can do no wrong. Love her! 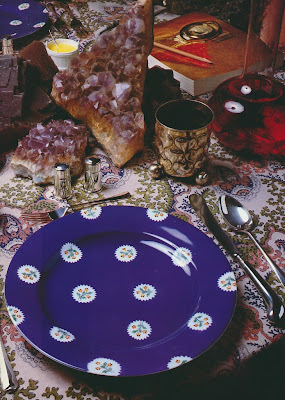 I'm going to start paying extra attention to Ina's show in hopes of catching a glimpse of the violet pattern dessert plates. They sound lovely! or for everyday, Botanic Garden by Portmeirion http://www.portmeirion-botanic-garden.com/. Thanks for the fun Tiffany tour. I'll eat anything off floral china, anytime! Charlotte- Oh yes, Flora Danica is the ultimate!! Truly lovely. The Portmeirion is awfully pretty too! The Charlotte store has these HUGE silver and gold urns that they use for their arrangements. They are absolutely amazing. I asked about them once and cannot remember who collaborated with Tiffany on them. Meissen or Limoges, someone like that. They weren't for sale lol. 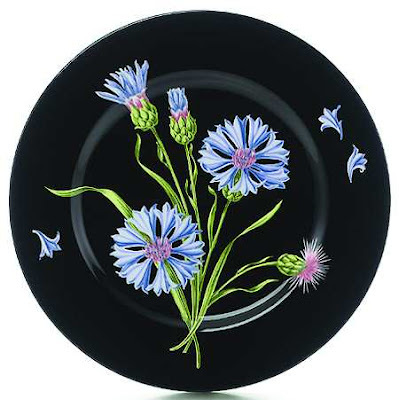 The bright flowers on the black backgrounds are both beautiful and dramatic, but I don't like to eat on dark plates, so I would keep them for display or serving pieces. My grandmother collected light-green Limoges plates painted with daisies, so those flowered plates carry many happy memories. 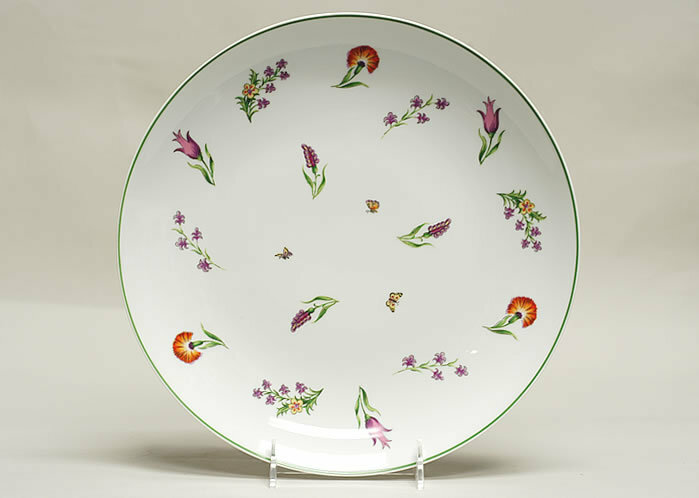 I bought one of Sybil's "Mrs delaney's flowers" plate years ago at Tiffany's in London. I hung it proudly on my wall in Paris and within ten minutes it fell off and broke into smithereens! I still keep it in pale blue box. I've since bought one of her pleated skirts... A true protagonist of the Irish American Dream! I am not a big fan of floral, ub definitely make an exception for these! What great detail! Matters of Style, those urns sound magnificent!! Might need to make a trip to Charlotte just to see them! Parnassus- I love the idea of daisy china! Now that I think of it, it's not often that one sees china with daisies on them. Peggy, I'm going to Google your china so that I can see what it looks like. Sounds beautiful! Anon- Now that's a heartbreaking story! Can it be repaired? Haus and Home- Glad you like these! In the early 90's I called on Sybil Connolly in her heavenly house on Merrion Sq in Dublin she couldn't have been more charming, she had things for sale I bought an open top basket for tissues she told me Hubert Giverncy was a great fan of these baskets so of course I had to have one.Her dear old butler took me on a complete tour of the house and guest house at the bottom of the garden where all the Tiffany people stayed, the whole thing was total bliss,have never spent such a happy morning full of riveting stories,you have bought all the memoris back,thank you! Bumble- How wonderful! I've seen photos of her Dublin house, and it looked absolutely charming. Those open top tissue baskets sound so clever; I'm trying to picture what they look like. Gosh, what an experience! Just found a Tiffany Private Stock porcelain multicolor floral piece with brass hinge and band. It is a round top and bottom--signed on the bottom. Any idea for it's value????? Also a large black eff with a rabbit on the top plus other painted designs. ??Value. Both in very good condition with wear on the brass. I own a set of 4 tiffany wildflower salad plates and matching mugs...... any one interested in buying?? ?